JOLLIBEE HAPPY PLUS CARD and I. Two Filipino brands partner to bring the country's first cashless payment card with rewards. Jollibee and BPI had a ceremonial tap of Happy Plus Card at Jollibee Mind Museum at 32nd street, Bonifacio Global City yes simply called the Fort last July 9, 2012. BPI is providing the payment infrastructure for Jollibee using the latest technology NFC (near-field communication) with the introduction of an NFC-powered privilege card called Happy Plus. So, what is Happy Plus Card? Happy Plus Card is a cashless payment card with rewards. The HappyPlus Card is basically a reloadable debit card powered by an NFC chip. This system reminds me of Octopus card in Hong Kong and Top up Card in Singapore. Wooooot! The Philippines will soon be a tech-savvy country. I can imagine paying using an NFC card in MRT/LRT, buses, restaurants. Ahhh the possibilities are endless. Jollibee decided to use NFC for their new Happy Plus cashless payment system simply because payment is much faster. then wait for the connection to happen. then wait for the receipt to be printed. then you sign the receipt. then you get back your card and a copy of the receipt. Way too tedious for a fast food counter that has a long waiting line. With Happy Plus Card all you have to do is tap your card on the terminal to pay and you’re done! When do I get rewards point? 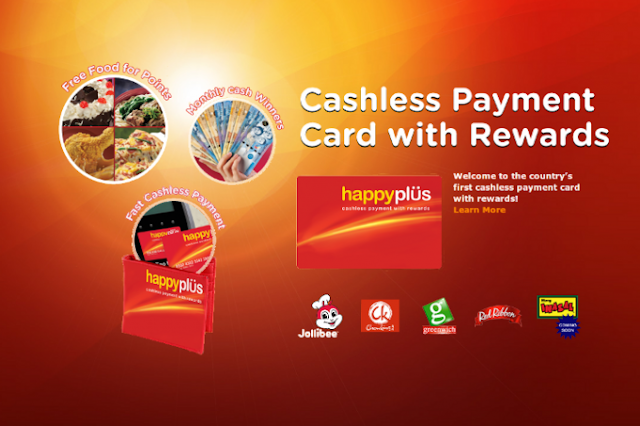 You get rewards points every time you use your HappyPlus Card in the participating stores. Every 50 peso purchase gets you 1 point. 1 point is equal to 1 peso. If you keep on using your Happy Plus Card at Jollibee, Chowking, Greenwich, Red Ribbon and soon Mang Inasal, you'll soon accumulate enough points that you could use to purchase your meals for free! Not only that! Aside from earning points when you pay using the Happy Plus card you also get a raffle ticket every time you load your Jollibee HappyPlus Card from any participating stores. Those tickets are entered into the monthly Happy Plus Raffle where you can win up to 100,000 pesos every month. Yehey! Just go to the nearest Jollibee, Greenwich, Chowking and Red Ribbon store and buy the 100-peso HappyPlus Membership Kit from the cashier. Fill out the registration form. Give that back to the cashier. From there you can start loading and using your card. Or you can also register online. Once your card is loaded, you can use it in Jollibee, Greenwich, Chowking and Red Ribbon and soon Mang Inasal. Plus there's an added bonus! The Happy Plus Card kit contains discount coupons which you could use when you dine in your favorite Jollibee, Greenwich, Chowking and Red Ribbon and soon Mang Inasal stores in Metro Manila. So what are waiting for? Buy your HappyPlus card now! Thanks to Azrael and Apol for the invitation. Because of them, I was privileged to meet the man behind Jollibee. That's another check to my bucket list. Thank you guys for making my dream come true. You don't know, how much you made me happy! The very humble and kind Mr. Tony Tan Caktiong (Chinese: 陳覺中) and I with the Jollibee mascot. He is the founder and current Chairman and CEO of Philippine fast food chain Jollibee. Bilis ng bayad, Sarap ng rewards! At the moment the card can't be used when ordering for a delivery. Though the guys from Jollibee said it will happen soon with the use of a mobile device. what should i do if i lost my card?